The quintessential New Jersey boardwalk is an elevated walkway often over or next to water particularly the ocean. They make access to waterfront towns easy and appealing. Boardwalks across the country are made out of many different types of material. Trex Decking is a popular choice among many for boardwalks and other maritime causeways. New Jersey is well-known for its vast boardwalks throughout the state and many of the most popular are made with Trex Decking. 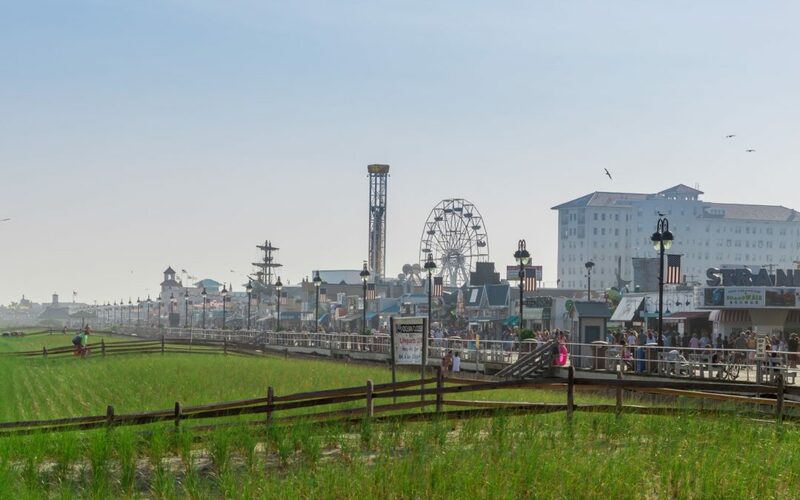 Most of the well -traveled Trex Decking boardwalks that adorn the New Jersey coastline are home to carnival games, Ferris wheels, water parks, candy shops, hot dog stands, and much more. Trex Decking boardwalks up the ante on the usual visit to the beach. Hurricane Sandy occurred in October of 2012 and was one of the most -deadly hurricanes in U.S. history. It devastated the Jersey shoreline and many of the boardwalks had to be replaced. The Jersey boardwalks are an integral part of the local economy and had to be replaced and repaired immediately as not to cause long term impact. Since Trex Decking will stand up to harsh elements and an abundance of foot traffic, it was one of the best choices for the rebuild. This 1.3-mile boardwalk was rebuilt using Trex Transcend Decking. The color selections were Spiced Rum and Lava Rock. These dark and earthy Trex Decking colors add a rich look to the seaside. Trex Transcend Decking will outperform the old boardwalks made from wood, pvc, other composite decking. It is fade resistant, stain resistant, scratch resistant, and mold resistant making it the prime decking choice for an oceanside location. This half-mile boardwalk was also rebuilt with Trex Decking. It now appears that it will last forever. It was reconstructed with 15,000 feet of aluminum piping to ensure its strength in case of future hurricanes. This small boardwalk made of Trex Decking is festooned with 120 benches and 10,062 feet of sand fencing. One of Jersey shores most kid friendly boardwalks, Point Pleasant Beach has candy shops, mini golf, an aquarium, and toy stores. This Trex Decking boardwalk is Winchester grey lending to a truly east coast feel. Many of the homes that are steps from the boardwalk love the new Trex Decking Selection! Why is Trex Decking the Best Choice for Waterside Walkways and Decks? Since one of the most visited tourist attractions in America has chosen to use Trex Decking you can rest assured that it is a great choice for your home as well. Since 1996 Trex has been a leading contender among the various composite decking lines on the market today! If you are interested in installing Trex Decking in your home, give us a call! Our knowledgeable staff would be happy to walk you through the purchasing process and answer any questions you might have!